Emily's Recipes and Reviews | UK Food Blog | Leicestershire : pack up a picnic with higgidy pies. 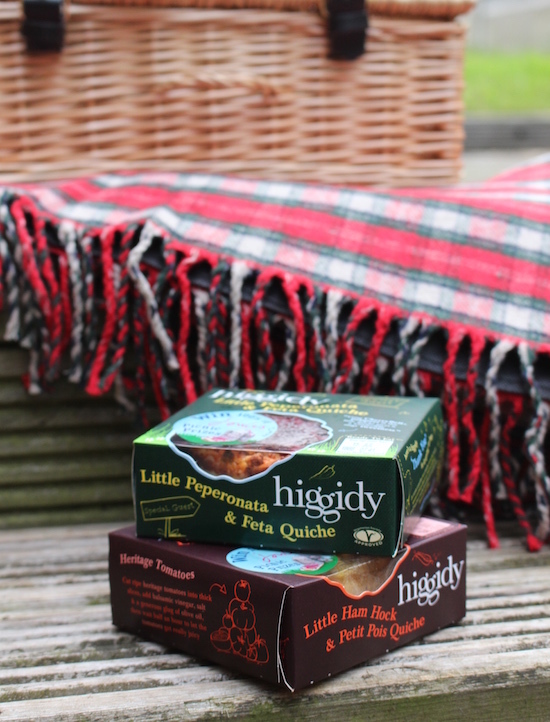 pack up a picnic with higgidy pies. Introducing a couple of cute new flavours to the Sussex based Higgidy family. The Little Peperonata and Feta Quiche, and the Little Ham Hock & Petit Pois Quiche are the perfect little addition to your picnic basket this summer. Also known for their delicious pies and larger quiches, these pocket size pick-me-ups are the right size for one. Or sharing, if you fancy. I already absolutely loved their Spinach, Feta & Roasted Pepper Quiche, and wouldn't be ashamed to eat the lot in one sitting. Another fab flavour is their Balsamic Onion & Cheddar Quiche. But, we aren't here to talk about them now are we? The Peperonata and Feta is delicious, with a sweet spiciness which marries up with the crumbly feta perfectly. They are made with free range eggs and as soon as you open the packaging you can smell the freshness and great quality ingredients. I love the seeded shortcrust pastry too - it adds a little something extra. Plus, this particular one is Vegetarian Society approved too! What do you think to the new flavours? Would you still want to share? Hmm? Not to pick favourites but the pies and quiches are best found in Sainsbury's by the way. I found my local Tesco Extra and Coop a bit thin on the ground - then low and beyond a whole five shelves of Higgidys in Sainsbury's! They've also teamed up with British brand Joules for some exciting prizes to be won - just check it out here or on the stickered packs! spicy king prawn spaghetti with samphire. sushi and robata, high street kensington, london. halloumi, mushroom and pesto stack. dublin: my little foodie city guide. salmon, asparagus, tomato and basil risotto.